We stopped at No. 7 Sub for breakfast sandwiches before our scout yesterday. 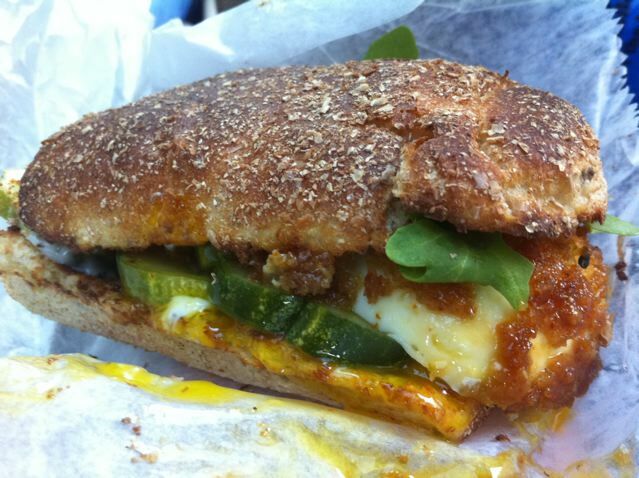 I had the General Tso's Soft Boiled Fried Egg Sandwich. They take a soft-boiled egg and quickly deep fry it in a chicken-like breading and then douse it with a semi-spicy sauce. Add this to some crunchy pickles and arugula on a toasted bun. That looks like the best thing in the entire world. I am gaga over this sandwich. Tell me more. Please! Okay, I just showed Tina this and she had an equally ridiculous reaction. Please explain the spicy sauce and she has also asked you to try to replicate this or help us replicate it. Or better yet, a true EAST & WEST collaboration. Happy Thanksgiving! my gawd that looks good. nothing but fried snapper and aperas for me... every day!